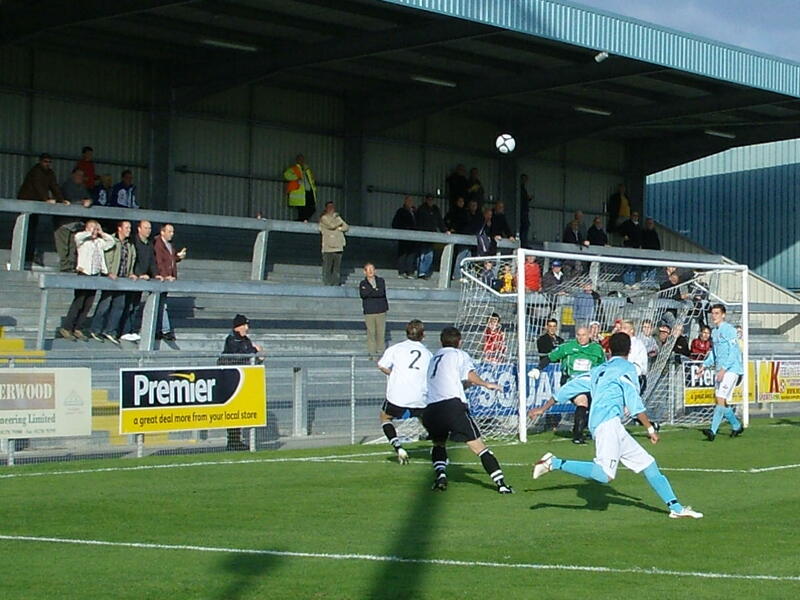 About the Woodspring Stadium The club moved to the new purpose-built Woodspring Stadium in August 2004. They previously played at the similarly-named Woodspring Park a short distance away. 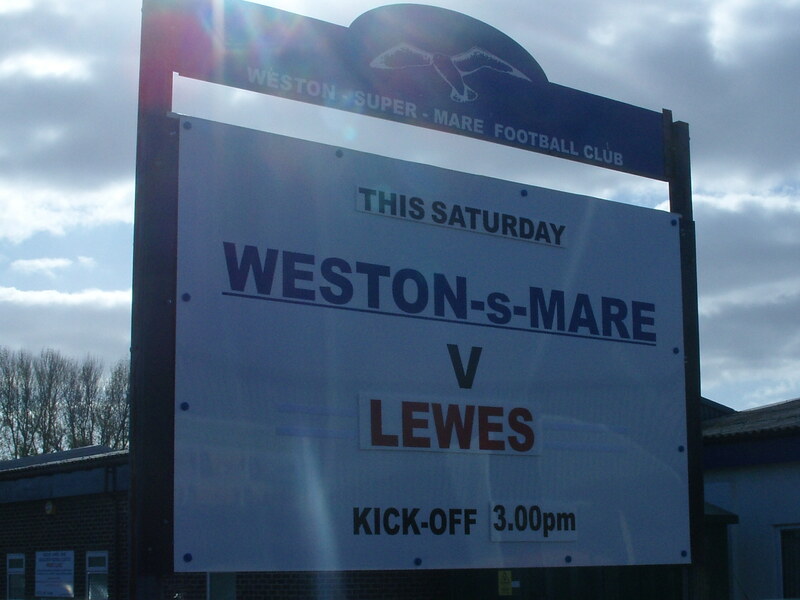 The move marked the third time in the past 40 years that Weston-super-Mare have changed venues. The capacity of Woodspring Stadium is 3,500 in which 2,000 is covered and 350 are seated. Woodspring Park had been built almost entirely by supporters and boasted a clubhouse costing £100,000. Weston-super-Mare sold this ground to a residential home builder when it became apparent the club was going to move the short distance to Woodspring Stadium. The last home fixture was played in April 2004. The ground for what is now Woodspring Stadium was formerly a sporting complex owned by Westland Aircraft known as Westland Sports Ground. It was home to cricket and football in addition to social buildings. Difficult financial times forced Westland to reconsider their place in town and put the ground up for sale. Weston-super-Mare purchased it for £270,000 in 2001. The Stadium opened August 14th, 2004, with its first match against Conference South opponent (and now defunct) Hornchurch drawing only 500 people to the game. Average attendances these days rarely hit the 350 mark. How to get to the Woodspring Stadium Whether you are coming from the North or South it is much easier to come off at junction 21 of the M5 and then follow a path straight ahead on the new dual carriageway heading towards the town centre. Keep going straight across three roundabouts continuing to head towards the town centre. At the 4th roundabout you will see a Mc Donalds on your left and a big Asda on your right, as you approach the roundabout turn left then as you come to a mini roundabout carry on straight across (2nd exit). Carry on over the railway bridge and you will see the new ground on your right hand side within a few hundred yards. The train station is about a 30 minute brisk walk from the ground. Come out of the station using the exit and platform opposite the main entrance. Walk along till you come to a busy roundabout (you should see Aldi on your left). Walk across the roundabout and head towards Halfords. Walk to the right of it following the road through the shopping area which includes Comet, Curry,s, and Pets at Home. Keep walking till you go past the Kentucky Fried Chicken drive through and see a roundabout beyond it, walk past that and up to a mini roundabout. Turn right on the mini roundabout and carry on walking over the railway bridge and the ground is on your right hand side. How to get a ticket for the Woodspring Stadium No problems about getting a ticket on the day of the game with nearly 3,000 spare spaces on most matchdays. Admission is £10 for Adults and £2 for Children. There is no additional charge for one of the 500 seats. Our last visit – Weston-super-Mare 3 Lewes 2 – 17th October 2009 Weston-Super-Mare, or for all of those fans of Men Behaving Badly, Weston-Sloping-Mare is one of those places that 99% of the British Isles would have to look for on a map before they played “pin the tail on the donkey of English seaside towns” (a winner on those long winter nights in the Fuller household I can tell you). I was in the 1% having spent a couple of hours there a few years ago with my elder brother Nigel (aka “Dog” – long story but something to do with a house that was near a pub or something) whilst we had been sent on a food errand on a family holiday in nearby Torrington. 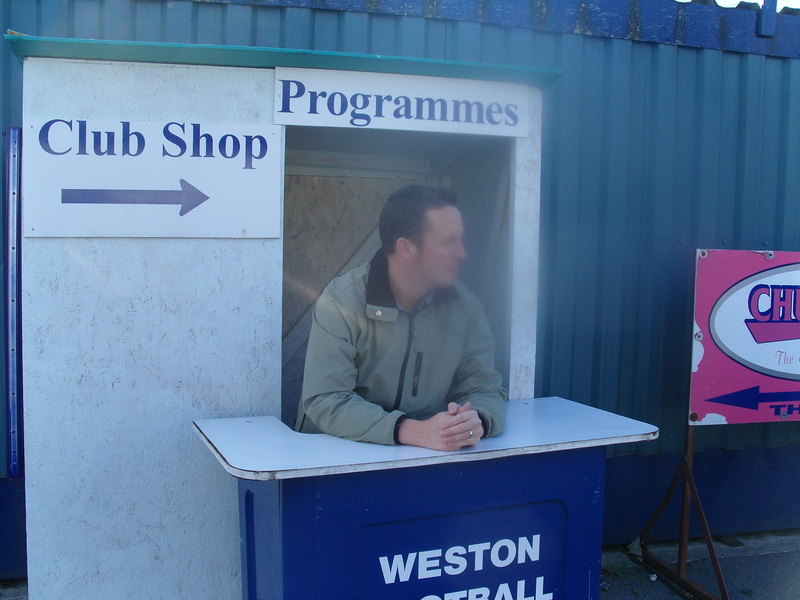 As usual the old Fuller nose for football grounds had sniffed out Weston-Super-Mare FC’s home ground but due to a strange kick off time we had missed the game so after doing Morrison’s in 10 minutes we hit the prom, well the pubs, for an hour. The EFW team, being ardent Lewes fans had pencilled this one in as a “must do” game, and who were we to disagree at TBIR towers. We needed a break from the constant media requests after the publishing of Passport to Football, having appeared on CNN, ITN, BBC Radio Midlands and Christine and Neil Hamilton’s balcony. Results had not been kind on either team as they entered this must win game in the bottom three of the Blue Square South. Two wins from a total of twenty four games between them was hardly inspiring form, and Lewes were still waiting for their first league win of the season. Weston-Super-Mare actually have a unique claim to fame. They have never been relegated. Yep, let me just pause whilst you pick up your bacon sarnie, they have never been relegated in their one hundred plus year history. More recently they had come mighty close to losing that record such as in 2006/07 when they were saved due to the Farnborough’s enforced financial relegation and Hayes chosing to merge with Yeading. Last season a 17th place disappointing but easily enough to keep them in the league for another season. So Danny, Dave and myself met at 9.30am at Paddington Station ready for our first big away day of the season. To help us keep focused on the day I had put together a Fat Matt inspired quiz for the day – rules were very simple. £1 in for each question, and 20 questions in total so there was a cool £20 up for grabs. Question 1 – What platform would our train to Weston-Super-Mare depart from? No joy for any of us on this one despite Danny’s blatant cheat in ringing up the station the day before! Platform 5 eludes us all 2 – The price of a can of beer on the train? Surpringingly enough at such an early hour we do not venture down to the buffet car and so have to rely on the train managers guess of £2.75 which was closest to my £2,.70 guess….1-0 To Stuart 3 – Time we get to Reading Station? Danny’s 9.55 took this one as we arrived 4 minutes late at 9.57 As the train pulled into Swindon we were joined by two more fans of the blog(s) with Big Phil from Forest Green and his crew of one (Andy) hopping on the EFW express, as they couldn’t face the away game at Histon. Things have marginally improved at the club since we last spoke to him (click here for details). We moved effortless from our luxurious train to Bristol to one of those silly two coach trains for the final leg and pulled into Weston-super-Mare at midday, looking forward to the UK all-comers Wrestling championships (at the Winter Gardens), the “Big Wheel” where on a good day you can see Wales – why is that good? and finding Somerset’s Premier Gentleman’s club. 4 – Number of taxi’s waiting for a fare at Weston-Super-Mare station? Amazingly none. Didn’t they know the mighty Rooks were in town? Our bets ranged from 4 to 8 on this one – oh dear! 5 – First Premier League shirt we see in Weston-Super-Mare? So we went on a proverbial pub tour of all that Weston had to offer, choosing pubs where we would be risking our London voices…But we struggled to find a shirt. Thirty minutes into our quest two came along at once just like a bus…and both were Liverpool ones…Not handy when we had gone for Man Utd or Chelsea…Not going too well at this point! 6 – Walk in minutes to the nearest pub? So we avoided “Rails”, the pub on the platform and instead walked to the nearest one, some 6 minutes away to the Queens Terrace which was exactly the distance Dave thought it would be – 1-1-1. 7 – Price of a pint of local bitter in the first pub we get to? The pub didn’t actually have any local beer and so we based this on a price of John Smiths at £2.75 and thus Mr Last took the lead 2-1-1. 8 – Number of bar staff working behind the bar at above pub? But Dave quickly pulled level as his call of 2 people slouching behind the bar was absolutely correct. 2-2-1 9 – Time it takes to walk from station to ground? So after taking in a few more establishments, including one with a fish tank in, we passed said Lap Dancing bar and started our yomp to the ground. And yomp it was. Some 35 minutes later having passed the most uninspiring scenery we arrived at the ground and immediately headed into the bar. Skittles is big down this part, and the club has two “lanes” neither of which they would let us use – boooh. So instead we had a few more beers, waiting until 3.01pm to avoid the crush before we headed inside. 10 – Pages in the programme? Such was the demand for our visit that the club had sold out all of their programmes. Danny decided to see if he could re-create the moment the last one sold out in true Phoenix from the Flames style but nobody bought it (quite literally). So we had to visit the club shop and ask how many pages – bing, bang boom Stuart calls right with 24 pages and thus we went into the game all square at 2-2-2. Neither Arnie or Crabby were in the starting line up, although both were on the bench and Danny and I caught up with Arnie as he was warming up. He was concerned that he may not get back in time for a decent night out, rather than would be get a game! 11 – Minute of first corner? First Corner, to Weston came in the 11th minute – some 9 minutes after my guess and 4 after both Danny and Dave’s so they got a point each. 2.5-2.5-2 12 – Minute of first card issued? If it wasn’t for Arnie’s update we would have missed this as it happened in the first thirty seconds! So my guess of 21 minutes was the nearest – result.2.5-2.5-3…. Lewes looked short on confidence and even Dave Wheeler struggled to create any width on the right hand side. It was no surprise when Weston took the lead with on-loan Newport County striker Dave Gilroy put the home team in the lead just as I tucked into a nice West Country sausage. Just before the break Lewes, on a very rare foray into the Weston penalty area scored, thanks to Fred Foreman’s strike. 13 – Score at Half Time? 1-1 wasn’t on any of our cards so nil points all round. We headed out a minute or so after the whistle had blown from the cavernous club house but just in time to see Gilroy slot home his second at the near post and then a few minutes later he completed his hatrick essentially putting an end to any Lewes resistance. It was obvious the only thing Ibbotson could do was throw on the likes of Arnie. 14 – Number of 1st player substituted? And so he did. On fifty nine minutes Arnie came on to replace number 11, Royce and thus ending another little bet for all three of us. All of a sudden Lewes started believing in themselves. They started attacking for the first time in weeks, and even an injury to Wheeler which forced him off did not cause them to hold back. 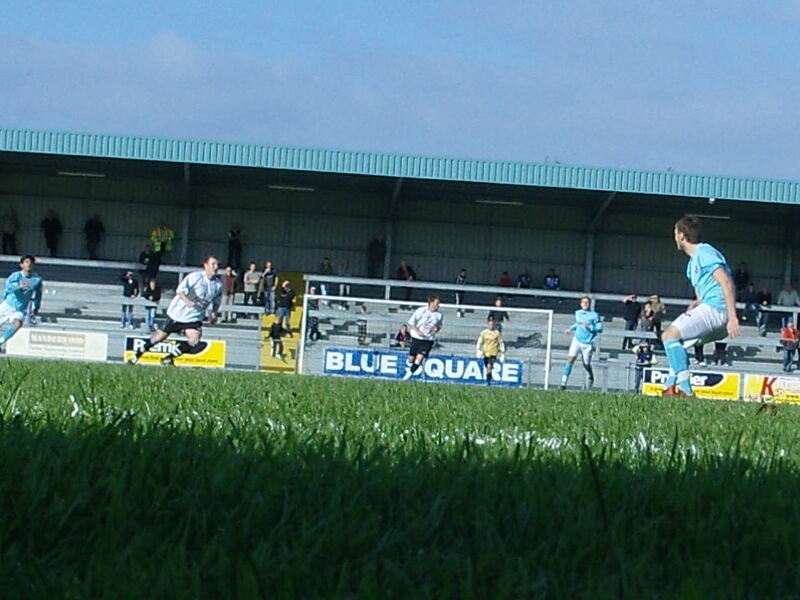 And they were rewarded with a goal, perhaps ten minutes too late as Pearson headed home. But that was as far as they got back into the game. They could take some positives from it, although a defeat to the team directly above you in the league is not ideal! 15 – Injury time played at the 90 minutes? One minute’s worth of Injury Time was not on any of our radars…. 16 – Number of Lewes fans at the game wearing Lewes shirts? The Lewes Loyal following for this one was 5 – including Trev who had taken his wife to M & S earlier in the day and expected her to still be there 6 hours later…as this one needed to be exact Danny came the closest with 4, but no cigar for this one. 17 – Total number of Lewes player shirt numbers at full time on pitch? A hard one to predict as you never know if they will use squad or team numbers. In this case it was team numbers and with the three substitutions taking effect the final number was 89. Danny’s 79 was the closest on this one so he gets the point – 3.5, 2.5, 3 18 – Final Score Weston-super-Mare 3 Lewes 2…None of us got this but Dave called the right result and so the point was his. 3.5, 3.5,3 19 – Final score in Stoke City v West Ham game? 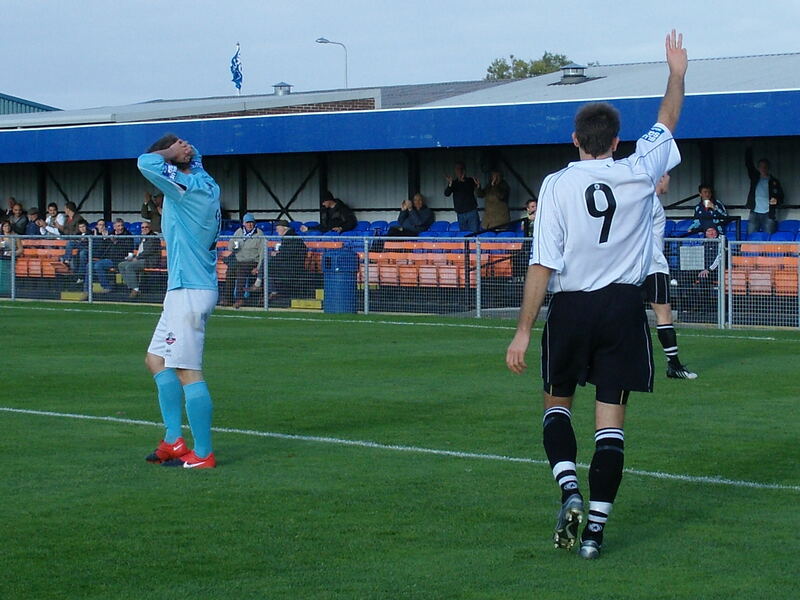 No comment as they went down 2-1 – shocking…. We stayed in the bar for our usual pint or two. In fact we stayed until we had to leave, as 1) we were the last people there, and 2) they wanted to get the room ready for the Cowboy and Indians night starting at 8pm (honest!). The players came in, loading their pockets with sausages and chips for the journey home. We took our queue to leave as an invitation to frolic on the hallowed turf and managed a few shots before our cab turned up. After an eventful trip back, punctuated by a group of pissed Swindonites, who had decided to go and get drunk in WSM for the day, and waiting 20 minutes to be served in a bar at Bristol Station when someone ordered 8 Latte’s – its a bar for f@ck sake – Starbucks is opposite! we passed the time with the World Soccer Quiz (thank’s for that WH Smiths) which I regained some pride with a 20-19 win against Dave, and steamed into Paddington 5 minutes early – yes early and so….. 20 – Time our train got into Paddington late? It didn’t! The competition ended with a tie for first place. Backslaps all round for a jolly good day out, and vows to do it all again sometime soon….er what about next week in Holland then for Octobeerfest!